We’d love your help. 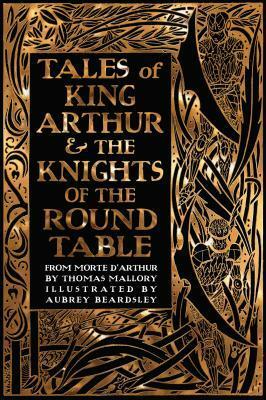 Let us know what’s wrong with this preview of Tales of King Arthur & the Knights of the Round Table by Thomas Malory. An essential collection of chivalric romance, swordplay, wizardry and brutal feats of courage Malory's 15th century Morte d'Arthur is one of the world's greatest pieces of myth-making, with most gothic and modern fantasy finding its roots in this splendid mix of history, magic and literature. This selected edition features many of Aubrey Beardsley's classic illustrations. To ask other readers questions about Tales of King Arthur & the Knights of the Round Table, please sign up. 2.5 stars; it would be two if not for the lovely illustrations included in the book + the fact that it's a condensed version, which I am grateful for. * Tristram and Isolde; their story was interesting. They were fairly flat characters, but the story had enough going on that I was engaged. * The early chapters of Arthur's childhood + the story of Excalibur. If you've seen Disney's The Sword in the Stone, you've basically seen this part of the legend. The Disney film is 2.5 stars; it would be two if not for the lovely illustrations included in the book + the fact that it's a condensed version, which I am grateful for. * The early chapters of Arthur's childhood + the story of Excalibur. If you've seen Disney's The Sword in the Stone, you've basically seen this part of the legend. The Disney film is actually pretty accurate to the legend, or at least this telling; I know this isn't the text it's based off of, but yeah. * The treatment of women. Almost all of them are "bad". I don't think the is a single woman in this story who doesn't do something awful. Plus...they all die. I felt bad for all of them, and I can only hope they get treated better in The Mists of Avalon. * Every other knight. Tristram is the only not-hateable one, and even then he still does some awful stuff, so he's not guiltless either. They all walk around acting like they're the greatest knights ever, even though they're...not. * Basically 80% of the book. Only two of the stories really held my interest, and I found myself skimming through the rest of them because I was just...so uninterested. You can only read so many chapters of knights being jerks and Arthur taking over the world before you start to lose interest.